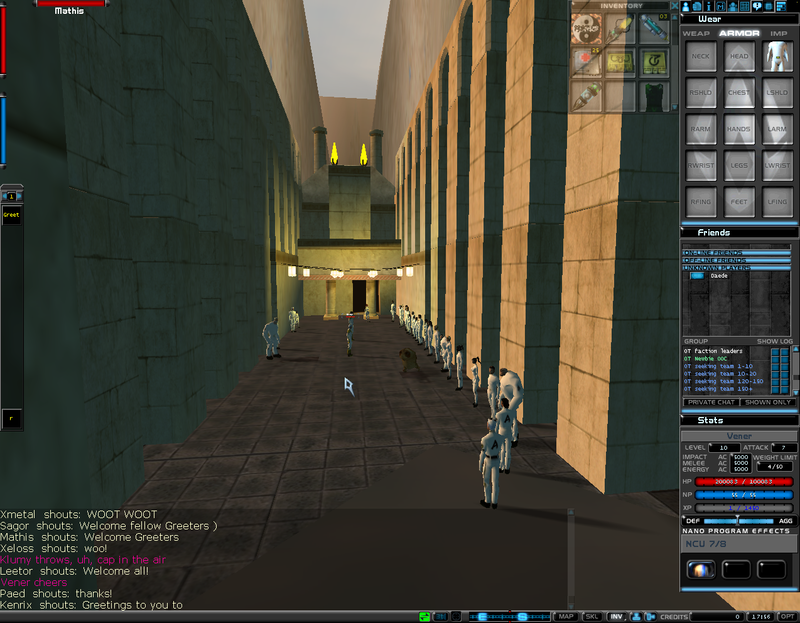 I was looking through some of my old web server backups for some ancient code I wrote, and I stumbled across a directory full of screenshots from my time in the Advisors of Rubi-Ka (ARK) program in the 2001 massively multiplayer game Anarchy Online. ARK was a group of volunteer Game Masters (GMs) that worked alongside the paid full time GMs hired by Funcom to support their game. ARK assisted them by handling basic petitions from players before further escalation, as well as running in-game events and doing additional bug hunting. Everyone in the group obviously loved the game and was happy to volunteer their time to help it in any way. It was modeled after the Guide program in EverQuest, before that was messily shut down. I had shared these screenshots privately back in 2006 to some friends who were curious about the details and structure of a MMORPG backroom. The same way there are rumors and fervent curiosity in the cast-only areas of Disney World, people love to see this behind-the-scenes info. So here are all the shots, detailing the majority of my nearly 12 months as an ARK. Its been more than a decade since I first shared these, and nearly 14 years since I first started snapping the screenshots but I’ll do my best to recount what I remember in detail. Please excuse any minor inaccuracies! I first applied to ARK back when I was first getting bored of playing Anarchy Online. All of my friends that had jumped over to AO with me on release had slowly quit and returned back to their previous haunts. I filled out the simple web form on the website as I met all their requirements, and was given an interview time. My interview occurred on the ARK IRC server. This was a private IRC server with a couple of channels that were heavily secured by the usual Nickserv/Chanserv services that were prevalent in IRC at the time. I joined a public channel and was DMed by Ziana who handled my interview. I absolutely can’t remember any specific questions but I believe there was some quizzing on Anarchy Online lore and gameplay specifics to prove my base knowledge and then some role playing in the handling of player petitions. A few days later I received my acceptance letter and was assigned a time for orientation on the next Saturday. It started in another public channel on the IRC server, the first part being a trainer ARK running through an IRC script that spat out a bunch of information and instructions to the new batch of recruits in the class. There were a few steps, such as picking your ARK name after which you were given your ARK Anarchy Online account username and password, and access to the ARK-only forums and the web portal that gave you the ability to handle player petitions. The next step was to create your in-game ARK character on your brand new ARK account and, after notifying the trainer, wait to be teleported to Parnassos. We started our lives as ARKs inside the GM jail. This is an enclosed area on the Game Master Play Field (GMPF) that included great decor like a skeleton and rusty pike to really set the mood. If you ever saw this room as a player then you had done something naughty. 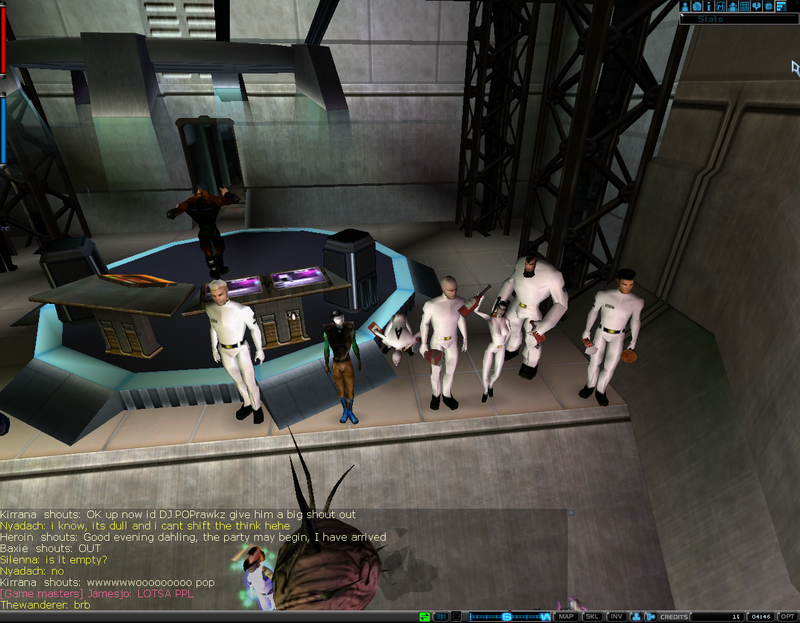 Ziana had us line up and wait as other new recruits finished the process of creating their character and getting jailed. After everyone was squared away, we were brought to the temple on the GMPF. This area was used often for anything ceremonial of which there was a ton of in the ARK organization. It really helped to set the mood and mystique of being in this organization. Honestly it was a great way to reward volunteers who are offering you free work in exchange for this kind of experience. 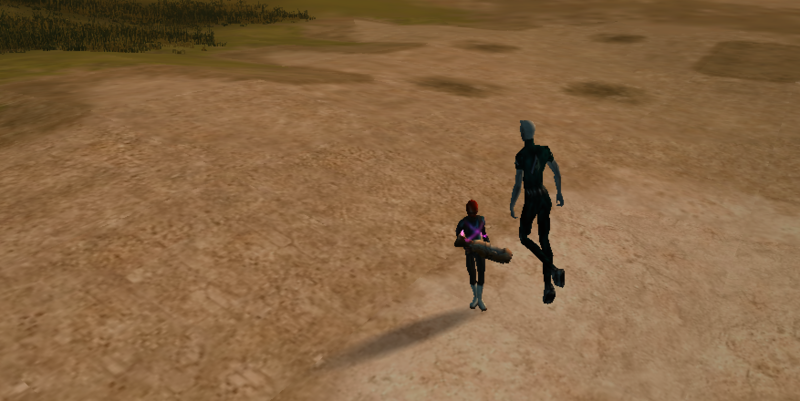 Our pathetic level 1 characters were lined up and another script was performed in-game, this time by ARK Ziana and a couple of Funcom GMs, specifically Kiazi and Leetor (the giant leet in the shot). The script furthered the mystique and described our depature from “a Normal” to become a member of ARK. Our characters were leveled up to 10, and we were given our uniforms and the basic GM powers needed to do our initial assignment. I immediately popped on my formal whites, only used by ARKs during ceremonies and other formal occasions. After everyone had received their buff, it was time for pictures and some celebration before the class continued. The class continued with some hands-on training, as we learned about our first assignment that of Greeters. It is time to take a quick aside to go over the basic structure and detailed hierarchy of the ARK organization. The group was broken down into a few different departments, namely: Operations, Events, Bug Hunters, Personnel, Community Relations and later Exploits. This page here on the AO wiki does a great job breaking down the responsibilities of each so I won’t needlessly reiterate it. Every new ARK begins life in Operations before possibly transitioning out. The departments themselves included a strict shared hierarchy. Again this page on the ARK website does a decent job describing the progression so please take a look. As an ARK recruit you’d start as a Greeter. As a Greeter you got to wear a great swimsuit uniform with neon green pants (a texture bug that was later fixed sadly). Everytime a new character was created in Anarchy Online, that character was added to the Greeter queue in the ARK web portal. Just like a petition from a player, you could take responsibility for welcoming a new player to the world of Anarchy Online and Rubi-Ka. We had a simple script: we would teleport to the player and introduce ourselves with a canned response and provide advice or answer any questions the new player might have. Most of the time it was just a veteran player’s alt so we’d wish them luck and head back home to the GMPF. It wasn’t incredibly exciting but it was cool to surprise players with a personal touch and most were appreciative. The same can’t be said for guards, which you can see above attacking another Greeter who created their in-game character in the opposing faction. Normally ARK characters would be “greened” – which was a flag set that made them invulnerable and untargetable by mobs. It also turned their name tag green in-game which is where the nickname originated. Some Greeters missed this step apparently! Advisors were also allowed to socially mingle with players as long as they were accompanied by another high ranking ARK to chaperon. Above you can see me, still a lowly Greeter, attending a player organized party in one of the many clubs in Anarchy Online. Of course you have to rock the dress whites for occasions such as these. These were some of my favorite moments as an ARK member. Interacting with the public was almost always a blast. The GMPF (proper name: Parnassos) was a playground, something the developers tossed together. It was made up of a rough grid pattern, with various biomes divided by 100 foot sheer walls. There was a section that contained dozens of vendor terminals, selling every single item that existed in the game. 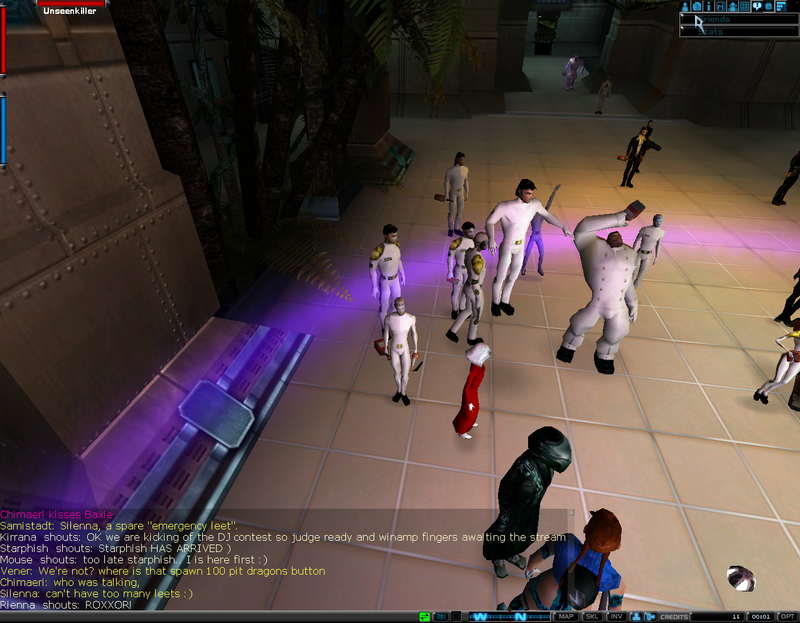 It was mainly used by the Events team to get their storyline characters properly equipped and costumed. We also used it to grab various nanos (AO’s version of spells) on our ARK character that we just used for special effects. 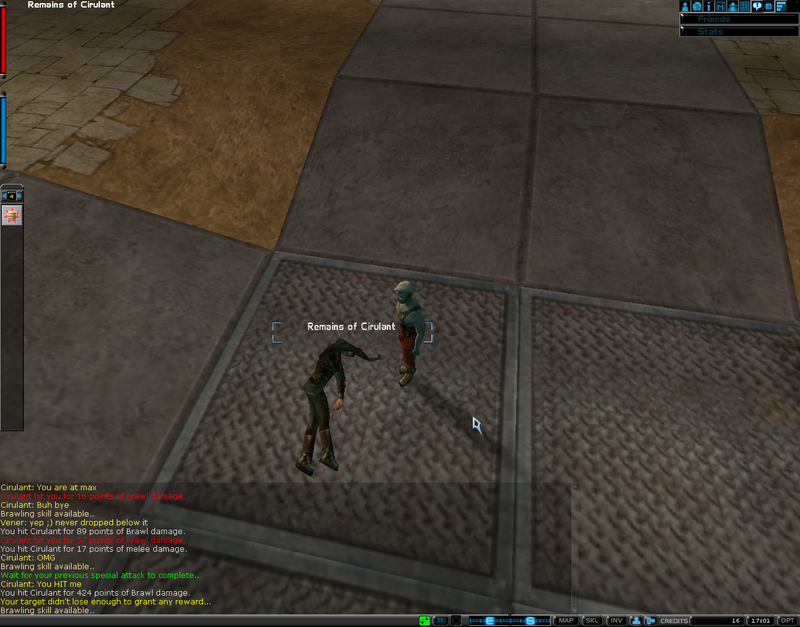 I mostly used Quantum Wings to give my character a cool hovering effect which you can see in the header image. Another grid square on the GMPF showing off a fort structure. 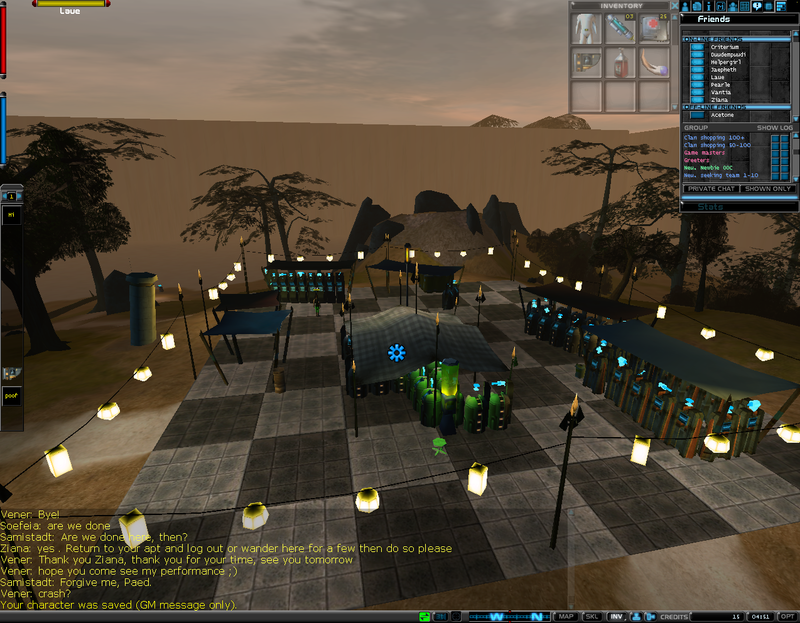 Of course the GMPF had a bar / night club area which was used to host social events. The screenshot is from the wrap party of another ARK initiation class. The water cooler of the GMPF was this campfire area. Every one would have this set as their return teleport coordinates for coming back to the GMPF after assisting a player out in the world of Anarchy Online. The rules for ARK were that if you were online on your ARK character, you were either helping a player with their petition or waiting here near the campfire. Another grid square from GMPF showcasing a swamp biome. There was also an arena area, where full PVP was enabled. Occasionally we’d have ARK fist fights – you’d have to remove your uniform first since it gave ridiculously overpowered defense and un-green yourself so you could be targeted.